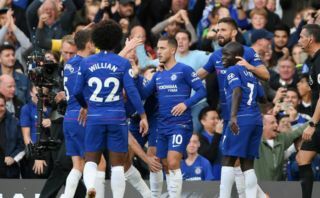 Chelsea defender Andreas Christensen has provided an update of sorts on the club’s potential transfer ban this summer – and it could mean good news regarding keeping hold of Eden Hazard. The Belgium international has long been linked with a move to Real Madrid, and will be in the final year of his contract at Stamford Bridge next season. Despite the threat of losing Hazard on a free, and with Sport suggesting he already has an agreement of sorts with Real Madrid, Christensen seems to believe the club will not be selling players due to their transfer ban. The Blues already have a signing coming in in the form of Christian Pulisic from Borussia Dortmund, who was signed in January before being immediately loaned back to the Bundesliga giants. Apart from that, however, Chelsea would be unable to replace Hazard this summer, so fans can perhaps at least take some comfort from this transfer ban as Christensen believes they’re not planning to let anyone go before next season. Could Eden Hazard end up staying at Chelsea? Regarding his own situation, the Denmark international perhaps didn’t sound too pleased at this development as he hasn’t been playing much for CFC and could be justified in seeking a move away.